Thanks to late and heavy snowfall in upper reaches of Himachal, reopening of Manali – Leh Highway would likely be delayed this year. Normally BRO starts removing snow from the road to Rohtang Pass and Baralacha La by Mid-March; however with western disturbances hitting Himachal and rest of North India in March, BRO has postponed its snow clearing operations till third week of March. Even the Lahaul and Spiti Administration has been forced to delay the deployment of rescue posts on either sides of Rohtang Pass, which are deployed each year on March 15 to ensure safety and rescue of locals crossing Rohtang Pass on foot. Once snow clearing operations begin, they are expected to take at least couple of months to cut through 40ft of snow on Rohtang and Baralacha La. So in all likelihood, Manali – Leh Highway wouldn’t reopen before third week of May this year. We will be posting frequent updates about the status of 2015 Manali – Leh Highway on LadakhExpert.com, so make sure to subscribe to our Ladakh Email Updates to get free and up to information on Ladakh. 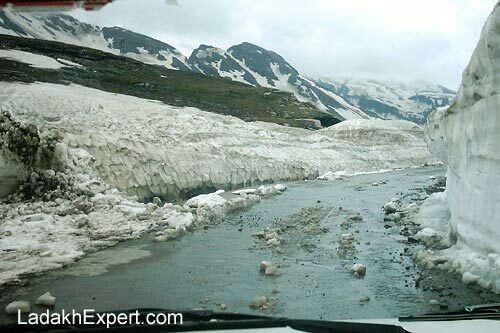 Himachal Government has announced today, that they will be closing Rohtang Jot on the 15th of November, 2013. With the official closure of Rohtang Jot, buses will stop plying between Manali and Lahaul Valley and only emergency vehicles will be allowed to cross Rohtang Jot. Though several local taxis will continue to sneak past check posts, and will keep plying till road is eventually buried under snow. For those planning to head to Ladakh by road, you will now have to depend on Srinagar – Leh Highway, which too is expected to be closed towards the end of this month. Manali – Leh Highway will remain closed till middle of May next year and only way to reach Ladakh in winter would be through flight to Leh. Manali – Leh Highway has officially reopened for 2013, 7 days after the initial deadline BRO had set for the reopening of the highway, earlier in the year. This delay has occurred due to heavy snow accumulation on Baralacha La and Tanglang La, which took longer than usual to clear. With the Manali – Leh Highway as well as Rohtang Jot reopened for tourists; it is time to rejoice for travelers, who had been waiting eagerly for this beautiful yet treacherous route to open, after it closed for the winter last year. Of course reopening of Manali-Leh Highway and Rohtang Jot does come with some strict restrictions this year by the administration, in a bid to reduce traffic snarls. So if you too are planning to head to Rohtang/Ladakh/Lahaul soon, please read our post Traffic Rules and Restrictions for Rohtang Jot in 2013. Another thing to keep in mind is, due to the High Court order, restaurants and temporary tea and food stalls at both Marhi and Rohtang Jot have been removed by the administration and although the court has directed HPTDC to provide mobile food vans, it is highly likely that there will be few if any places to eat/drink once you go past Kothi. So make sure you are carrying food and water with you, whether you are heading to Ladakh, Lahaul and Spiti or Rohtang Jot itself. Wish you a very happy and safe Journey to the land of the lamas.